Well, why not the largest linked ski area, not only in the Alps, but in the world. Even the largest ski area in North America, Whistler in Canada, would fit into a tiny little corner of it. My favourite in Canada is Lake Louise: 10 lifts and a decent 4,200 acres of terrain. And where better to stay than Les Menuires in accomodation provided by the traditional UK chalet company, Powder N Shine? 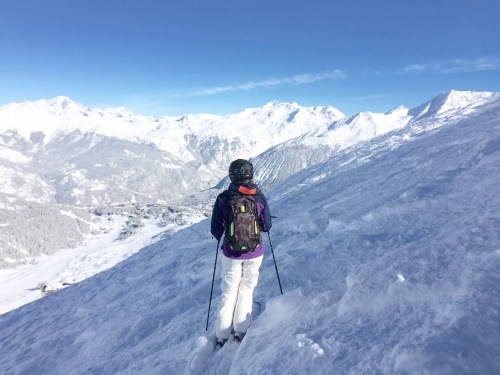 Marie will be looking at the ski area, the snow, the accommodation, the mountain restaurants, the atmosphere, the après and the overall experience. And any other comparisons she comes across. She'll be posting across the next week or two. I've been skiing since the age of 3 and skied in Western Canada across Alberta and British Columbia. Growing up and then living in the Canadian Rockies I would try to get to the hill as often as I could. And it was the beginning of February that I headed to Les3Vallees in France. Would the Alps match up to what I had heard about it? Usually in Canada I would go skiing at Sunshine Village just outside of Banff, Alberta, or my favourite, Lake Louise, which is just another 40-minute drive west. I absolutely adore everything about the resorts. The ski areas I love. But now I've moved to London and I'm going to experience skiing outside of Canada for the very first time. We flew into Geneva late Friday night from Heathrow and as it was snowing in London (a very small amount in Canadian terms) our flight was delayed. The first difference - our airports in Canada stay open after a few flakes of snow. We overnighted in the valley and then drove the mountain road up to Les Menuires early Saturday morning. We were advised by many people to ensure our rental car had winter tires and chains, as Les 3 Vallees had been getting dumped on in the past week. Luckily enough, we didn't need them, but the cars that had been parked overnight had over 20cm of snow to clear off. The snowploughs were out and it all looked rather promising to me. In the past week, there's been well over 1 meter of snow to hit Les Menuires. Insane amounts, and great conditions for my first time ski trip to the Alps. I've always been told that skiing in the Alps compared to Canada is different, but I never quite understood why. People would try to explain the differences, but all I was ever told is that "it's bigger". And after I had a weekend skiing Les 3 Vallées, it is definitely much bigger than Canadian resorts. But there's also many other differences, and I will make my final judgements later. Now I'll try my best to explain the major differences that I've noticed while skiing in Les 3 Vallées from the conditions, terrain, ski rentals and the chalet experience. First thing to do is rent skis and there was the first BIG difference. Hiring skis, or rentals as we call them, is miles ahead of the game in the Alps. The selection of rentals in Canada is horrendous. There are exceptions, like Whistler and a few good shops in other resorts, but by and large the rental selection is poor. In general, a resort has a partnership with one or two ski brands and those are the only skis that are offered. Whereas renting from Intersport Reberty 2000, the selection and quality of skis was unbelievable. There were all mountain skis, racing skis, and powder skis from many different brands. I was like a kid in the toy shop. The staff at Intersport were amazing - recommending what skis to rent for the current conditions, and even telling us where to go for the best snow. At first I was given Atomic all mountain skis - perfect for skiing on and off piste. The bindings were fitted to my boot and dins were set to 7, exactly to where I like them. They were great for the first day, however, overnight we received close to 20cm and the snow was still coming down...so back to Intersport we went to upgrade to some powder skis. This is where I realised how amazing ski rentals are in Europe. Without any questions or any extra fees I was able to switch my skis to Black Crows. Though they do that rather well too. And most definitely skis that would not be available to rent back home. Within minutes, my new skis were fitted to my boot, and I was off, barely missing any of the powder that day. Being able to rent such great quality of skis was amazing, and to be honest it still blows my mind. The entire rental experience, the range and quality of skis, the knowledge of the staff and the ease of being fitted was flawless. Definitely an area where North America can learn from the Europeans, as they are doing it right at Intersport. And so that is my first experience. The Alps 1, Canada 0. There has been some reaction to Marie's article over on the PlanetSKI Facebook page. Feel free to add your observations about the differences beweeen the Alps and the Rockies. ‪Steven Francis Stones‪ Canada is industrial sking not very pretty‬‬‬. ‪Sue Pierpoint‪ In 2013 we bought a condo in Big White, British Columbia, where we go twice a year. I have been skiing the Alps for many many years (used to be in the ski business) and still go once a year. We were accompanied last year with our great Canadian friends and went to Val Thorens, so same area as the author. They couldn't believe the extent and amount of lifts in the Three Valleys, and loved the mountain restaurants. However, a lot of the skiing in the Alps is about avoidance skiing as SO many people. BUT the skiing in Canada is all about the snow - the powder is so light you cannot make snowballs! It is totally ski in-ski out in Big White and saves so much travelling time. Although there are no mountain restaurants as such, many people go back to the resort village itself - we always go back to our beautiful condo - and have a hot tub in the afternoon! There are never anyone on the slopes so to speak in Big White - even at peak time. Yes, we don't have the vertical of the Alps, but that is more than made up with getting up the mountain quicker and no-one on the slopes. It is definitely worth the long journey, but you must go for a minimum of 9 days actual skiing to make it worthwhile. Steven Meare‪ Rentals here in Whistler are awesome and if you rent from the mountain you don't even have to go back to the village to swap your skis.